Darien's Ryan Stracuzzi (11) sends the ball over the net during the boys volleyball game against Staples at Staples High School on Wednesday, Apr. 11, 2012. 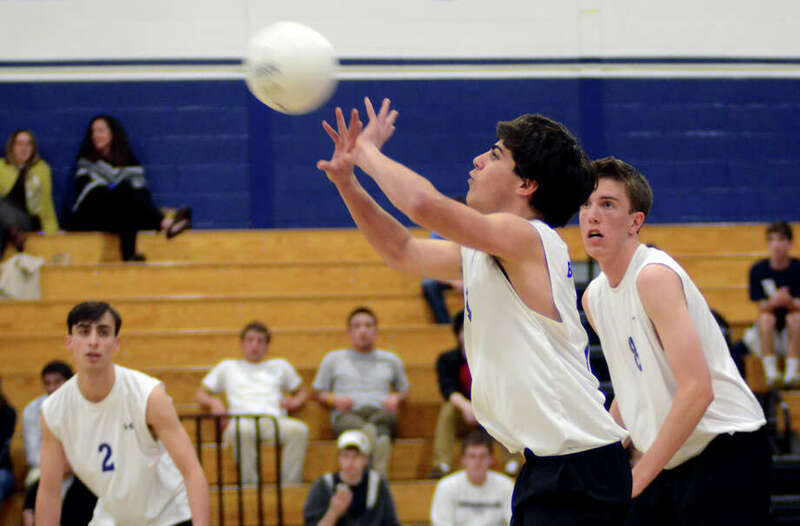 WESTPORT -- In a matchup of two of the elite FCIAC programs, the Staples boys volleyball team got a small measure of revenge against Darien by picking up a 3-1 (25-14, 21-25, 25-17, 25-19) victory at Staples High School on Wednesday afternoon. Staples, which saw its FCIAC championship dreams dashed by Darien in the 2011 final, seemed to be a step ahead of its biggest rival for the majority of the match. "It's good redemption after losing the FCIAC Championship against them last year. We consider this pretty much our biggest game on the year," Staples' Jonah Aelyon said. Staples led from coast to coast in Game 1. After Staples built a 10-4 lead, Darien closed the deficit to no closer than four points in the 25-14 decision. Staples' Emerson Lovell and Lucas Carstens played especially strong right out of the gate. Game 2 was especially competitive early, as neither team could build a two-point cushion until Darien took a 9-7 lead. From there, strong play by Matt Collier, Matt Lee, Sam Bryan and Ryan Stacuzzi paved the way for a 25-21 win for the Blue Wave. Darien led 18-13 before Staples tied the game at 19-19, but the Blue Wave regrouped to hold on for the win. "Staples is a quality team and we have a lot of respect for them," Lee said. "But we really only showed up to play in that second game; we brought the intensity and we were being more aggressive. I have to give it to them because they played a great game." Staples again held the lead for the entirety of Game 3 en route to a 25-17 victory. Darien seemed to have no answer for Aelyon, who dominated the net and notched a game-high 23 kills. Other than a 1-0 Darien lead in Game 4, Staples held the advantage for the entire match-clincher, a 25-19 win. After trailing 15-8, Darien got to within 17-16 but was not able to pull even. Staples will look to stay perfect when it travels to play Ridgefield on Friday at 5:30 p.m. Even with the big win over Darien, Staples knows it still has a long way to go. "It doesn't really mean anything because we have to play them again later in the season, and we'll probably see them in FCIACs again," Aelyon said. Although it was disappointed in the outcome, Darien didn't sound as if it would dwell on this one loss for an extended period of time, and is looking forward to seeing Staples again. Up next, however, is a home match against Bridgeport Central on Friday at 4 p.m.
"I think we came out slow in the first game, but we showed them what we can do in the second game," Collier said. "But then we slowed up again, and that's what happens when you slow up against good teams. We got a good look at them, and we know what to expect."